Details that change everything ! All effects are allowed: textured, hammered, pearlescent effects; Fantasy Moon colours used over fresh Vitrail or Ceramic colours also give marbled effects. The textured or marbled effect is instantly visible. The opalescent and pearly aspect is perfect for the decoration of all surfaces. You are looking for original shapes and a touch of fantasy? Nothing is easier! QUALITY: Textured effects, hammered, pearlescent and opalescent. Solvent-based, ready to use colours. Application with a brush in thin or thick coats. Good resistance to light. MIXING OF COLOURS: The colours can be mixed together. DRYING: to the touch in 2 hours, completely dry in 10 hours. SURFACES: Glass, mirror, terracotta, acetate, ceramic, canvas, metal, wood... DILUTION - CLEANING: Odourless mineral spirit or turpentine. Stir the colours thoroughly with a stick before use. The PEBEO Fantasy Moon colours: Can be applied with a flat brush in thin or thick coats on carefully degreased surfaces. 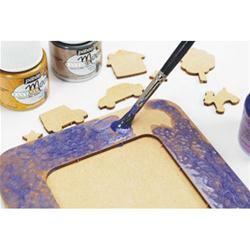 Can be used on fresh Vitrail transparent colours to obtain marbled effects. Can be used with the VITRAIL cerne relief with nozzle. The use of the VITRAIL Sparkling Medium adds glittering effects. To obtain pronounced marbled effects, CERAMIC colours can be applied over Fantasy Moon colours. To add a rounded effect to your creations, use the Gédéo Glazing Resin over very dry Fantasy Moon colours (48 hours minimum). The objects decorated with the Fantasy Moon colours must be considered uniquely as decorative objects and only surfaces that are not intended to be in contact with food can be decorated. Keep out of reach of children. If swallowed get prompt medical attention and show the packaging or label.